On Sunday we encountered heavy fog as soon as we headed out to sea, so the captain sounded the foghorn every 2 minutes. The scientists Jaime, Ryan and Kirsten deployed the Tucker Trawl. It consists of a large net with 3 codends. A codend looks like a small cup that attaches to the end of the net. Each codend collects sea life at a different depth. The Tucker Trawl is always deployed at the edge of the continental shelf. The shelf is about 200 meters below sea level. 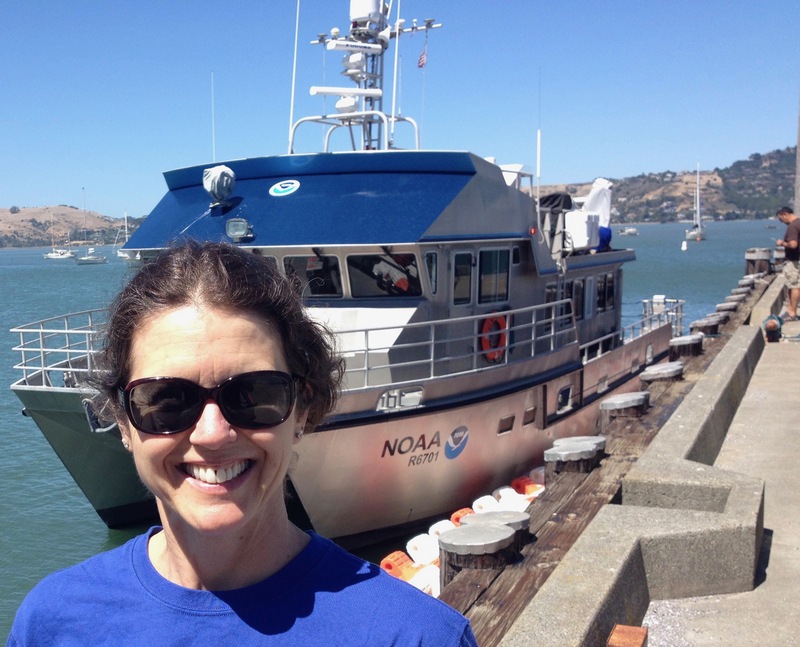 The goal is to take organism samples from the pelagic (non-coastal or open) ocean. 400 meters of cable are deployed along with the net, so you can see that it goes deep in the ocean! 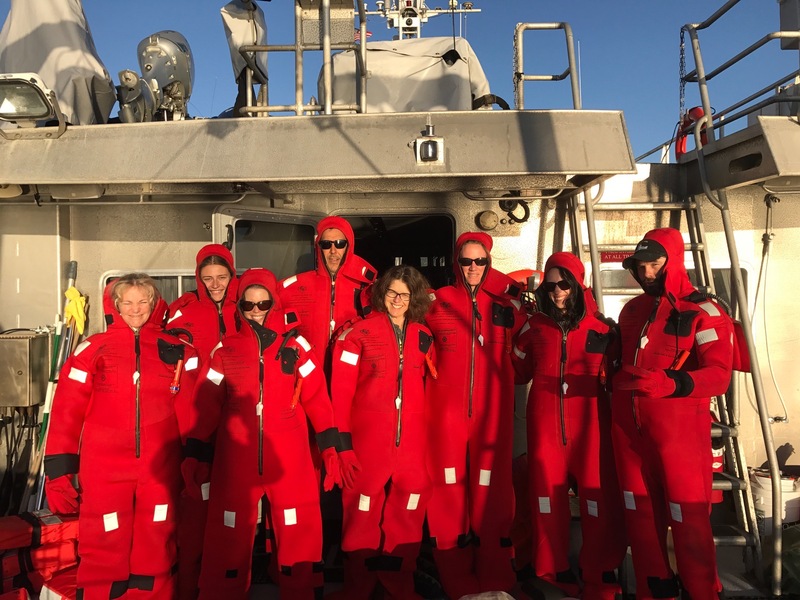 The scientists deploying the Tucker Trawl. Using the Tucker Trawl requires a whole team of people. 3 scientists deploy the net, and the captain operates the winch and A Frame so the net doesn’t hit the deck during the process. 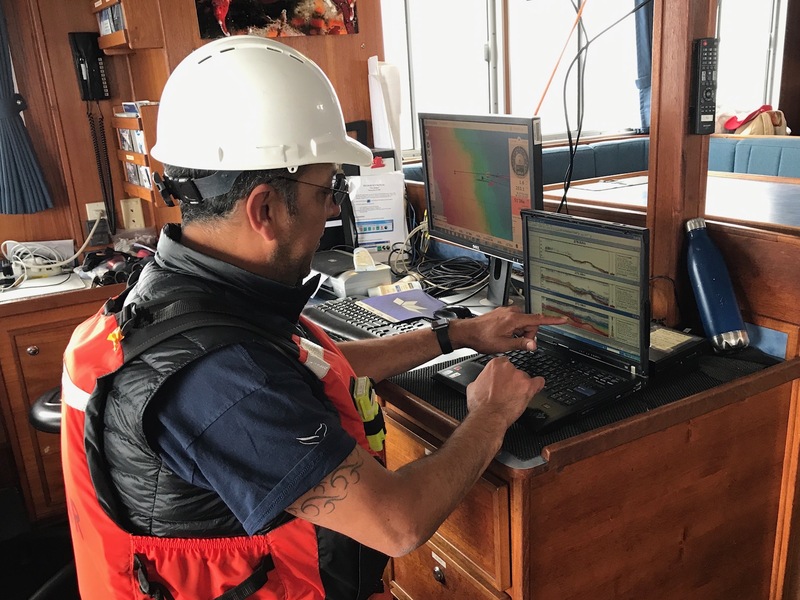 The NOAA Corpsman drives the boat so as to maintain alignment and speed. One scientist keeps an eve on the angle of the cable, and communicates with the driver to maintain the proper angle by adjusting speed. After recovering the net, all three samples must be rinsed into a bottle. Too much water pressure can mangle the specimens, so we use a gentle rinse. The bottle is then labeled and treated with fixative to preserve the samples. Then it is stored to later be sent to a lab for identification. I have learned that taking these samples requires a lot of communication, to maintain fidelity to a testable process, utilize equipment wisely, and to ensure safety of all personnel. 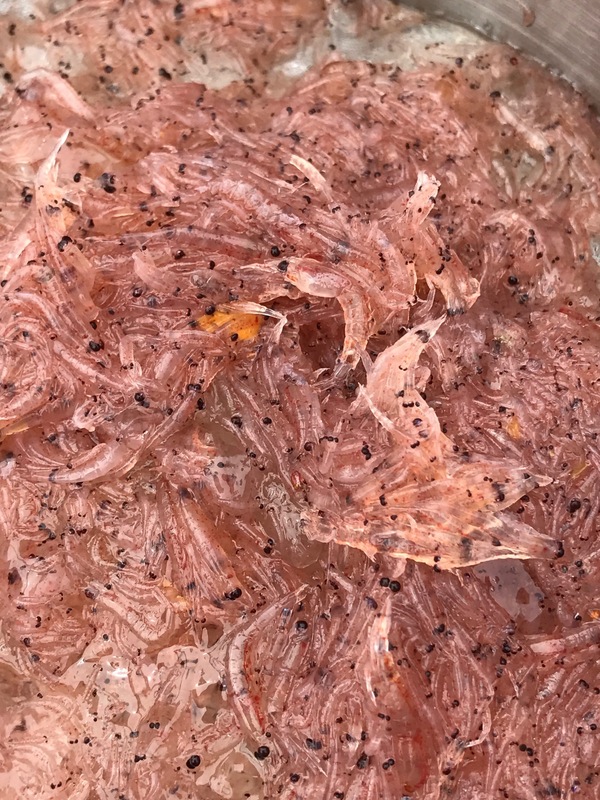 A view from above as the Tucker Trawl goes out to sea. Each offshore transect has one Tucker Trawl site. After that we move to another site and take Hoop net, CTD, Niskin, water, phytoplankton samples. I will explain these later. Sampling all of these sites provides data for the scientists to investigate the entire ecosystem. 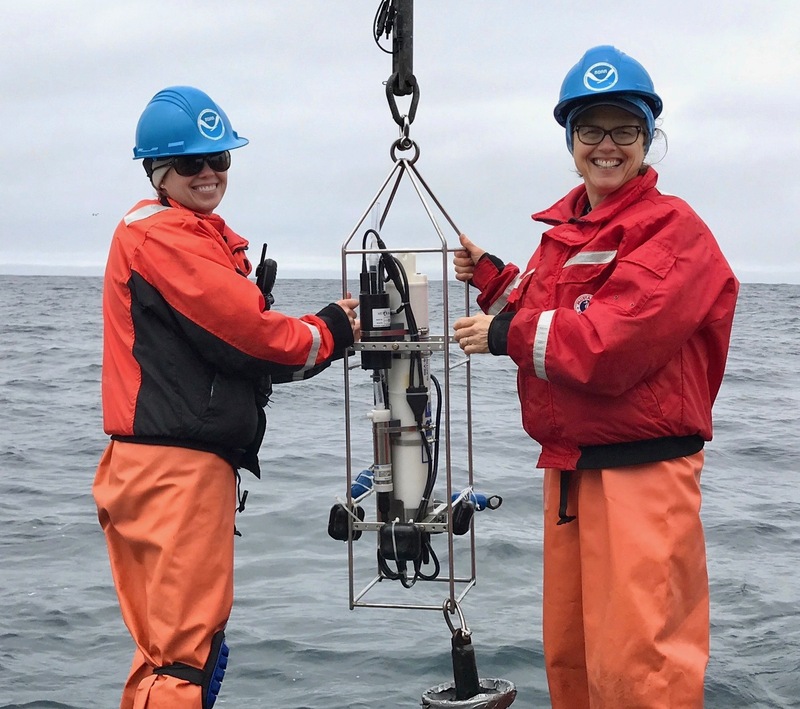 They collect plankton (producers) from shallow and deep water, observe marine mammals and birds (predators) on the surface, and sample the environmental conditions such as ocean temperature, salinity, nutrients, and ocean acidification indicators. These studies inform decisions for managing a sustainable environment for both sea life and humans. 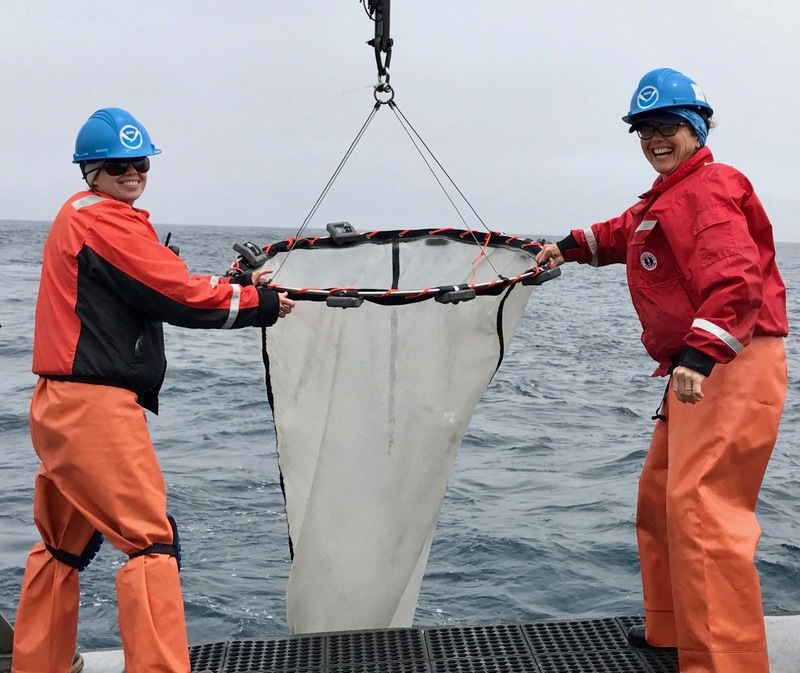 Two scientists collecting sea life from the Tucker Trawl. I want to tell you about the galley. This is the kitchen where we store and prepare our food. We have an oven, stove, microwave, sink and two refrigerators, but everything is compact due to limited space. All of the cabinets and the fridge have latches on them to keep food from flying around when the seas are rough. I have to remind myself to latch the fridge each time I open it. I don’t want to be the person who created a giant smoothie in the kitchen! We eat our meals at the table, which then converts to a bed for sleeping. Every little bit of space is used efficiently here. An albatross is part of the tube-nose family of birds. One of its features is having a tube nose above the nares. Nares are the openings to the nostrils. The birds also have openings at the end of the tubes. This adaptation gives it a keen sense of smell. We saw black-footed albatross, which nests in the Hawaiian Islands, and flies long distances across the ocean to find food in the productive waters of Cordell Bank and Greater Farallones National Marine Sanctuaries. So this albatross has been traveling at sea for a long distance! 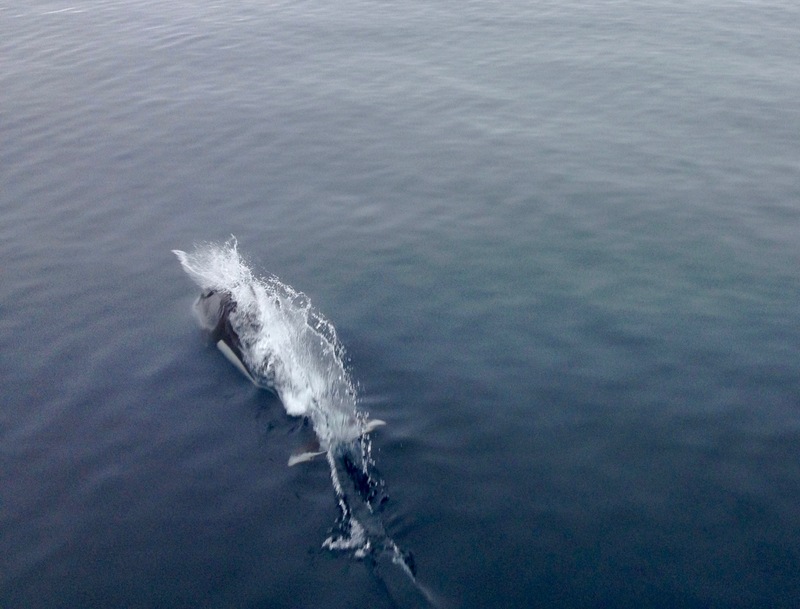 We spotted a CA sea lion cavorting in the wake of the ship. It looked like it was having so much fun as it leaped and twisted above the waves. Saturday was my first day out, and it was an excellent day for wildlife observation. In fact, that is what I did for most of the day. A highlight of my day was seeing two blue whales spouting right in front of the Fulmar. I tried to get a photo, but they went below the surface quickly. Blue whales are the largest marine mammals, averaging 20-25meters long and blue grey in color. It is called a cetacean, which means it has flukes, (tail fin), and may or may not have a dorsal fin (the fin on the back or top of the body.) This is in contrast to pinnipeds, which are marine mammals that use their flippers to walk. 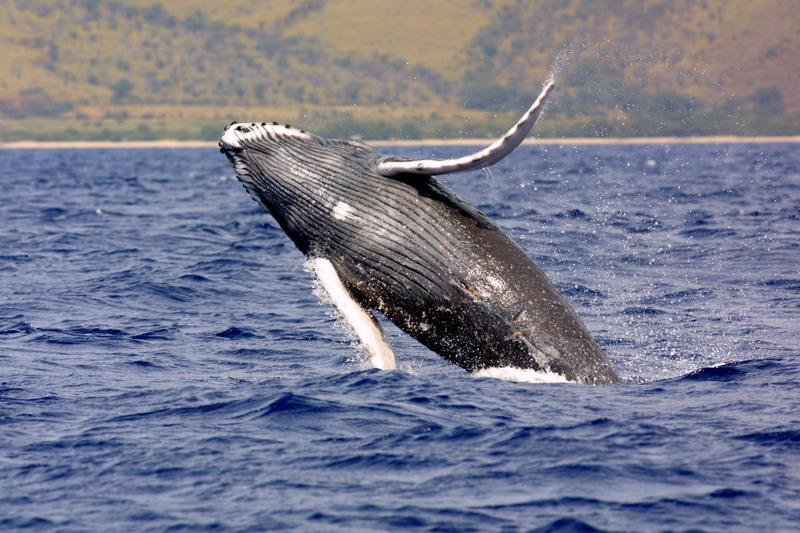 The blue whale is a baleen whale, which feeds by chasing prey up to the surface of the water. 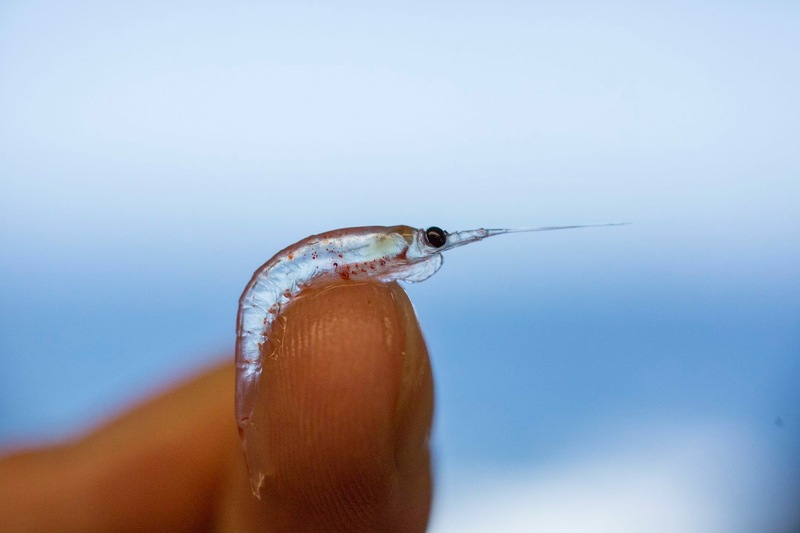 There it forages by swimming with its mouth open to catch small invertebrates such as krill and copepods. The baleen in its mouth filters out the invertebrates from the water. The whale we saw most often was the humpback whale. This baleen whale averages 11-13 meters in length, and is dark grey to black in color. 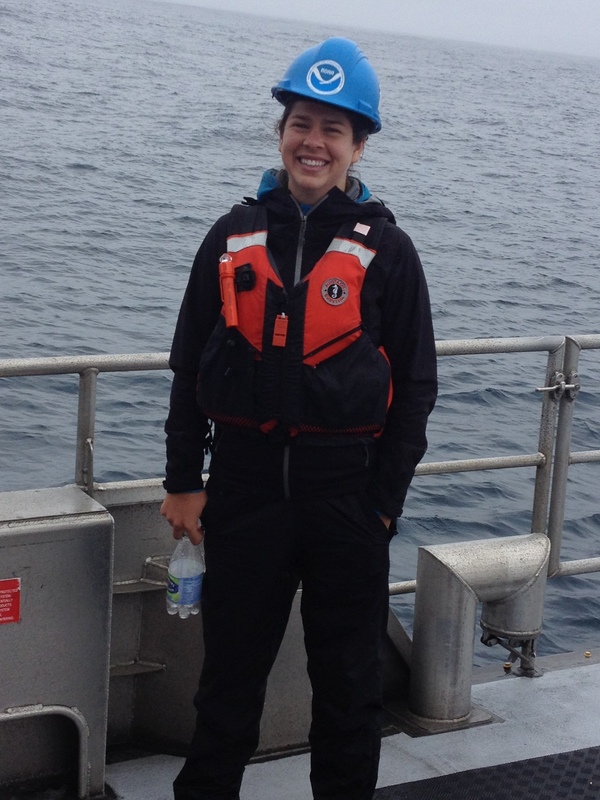 I was so excited to observe 3 tail flukes of humpbacks today! The scientists spotting marine mammals from the flying bridge. Common murre – including the first murre chicks of the season the ACCESS crew has sighted. Many marine animals tend to be found where upwelling occurs. Deep ocean nutrient-filled waters are brought to the surface by changes in sea floor topography, winds and currents. These nutrients fertilize phytoplankton (tiny plant life) that serves as the base of the food web. Whales return to these areas to feed on the small invertebrates that flourish there. These hotspots occur just off the Ca Coast. 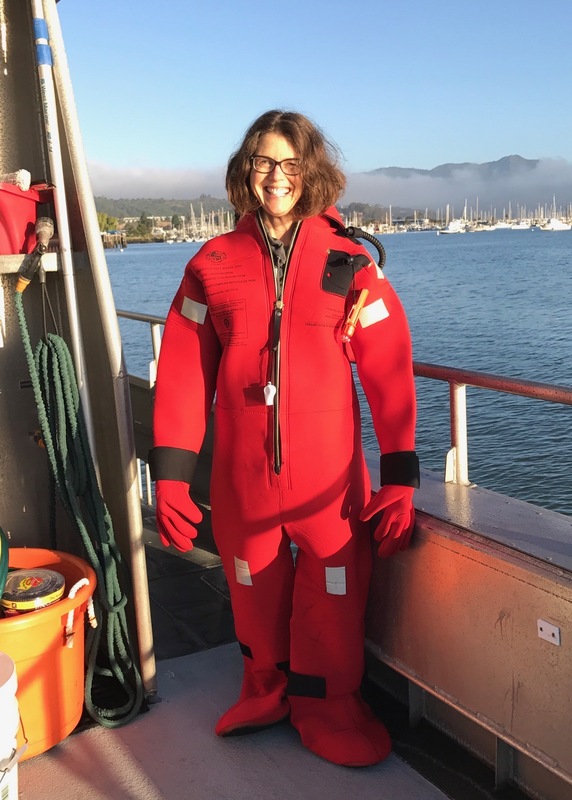 Protecting and managing these ecosystems is one major reason we have established National Marine Sanctuaries such as The Greater Farallones National Marine Sanctuary, Cordell Bank, and Monterey Bay. In a later post, I’ll tell you more about the procedures the scientists use to observe and record the mammal and bird sightings. That’s me, in front of the Fulmar! 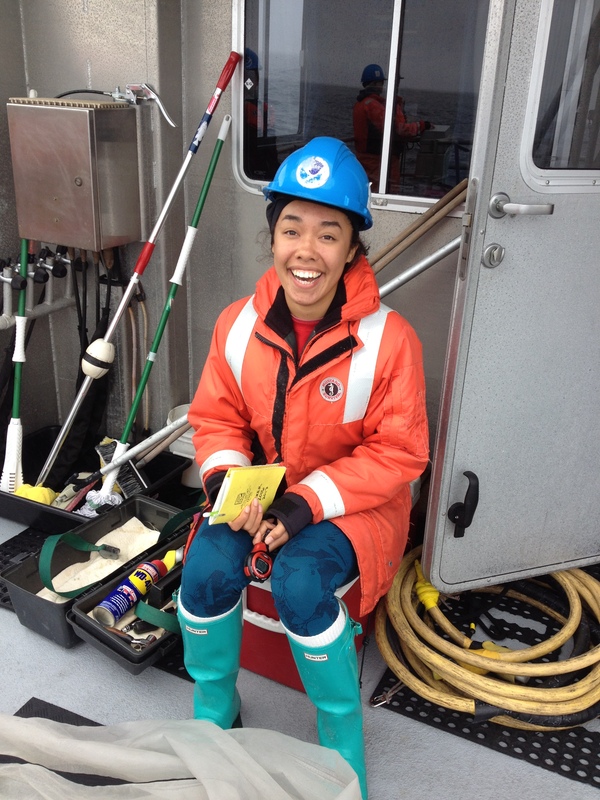 I settled into my berth onboard the R/V Fulmar. The ship can sleep 10 people, has a galley (shipspeak for kitchen), a wet lab (place to conduct experiments that are wet!) and one head (shipspeak for bathroom). Although the ship is only 67 feet long, the scientist and crew work together so efficiently that it is very comfortable. It has everything we need. I am rooming with Dani Lipski, who is one of the scientists. I’m on the bottom bunk. I’ll introduce her to you later on. She has spent a lot of time teaching me how to use the equipment to take samples. She has graciously answered my millions of questions! My bunk on the bottom. Do you see the ladder to the escape hatch on the right? I am delighted to find that I am not feeling seasick. My doctor did prescribe me the patch to wear behind my ear, and I guess it’s working! In any case, I’m not taking it off to test it out. 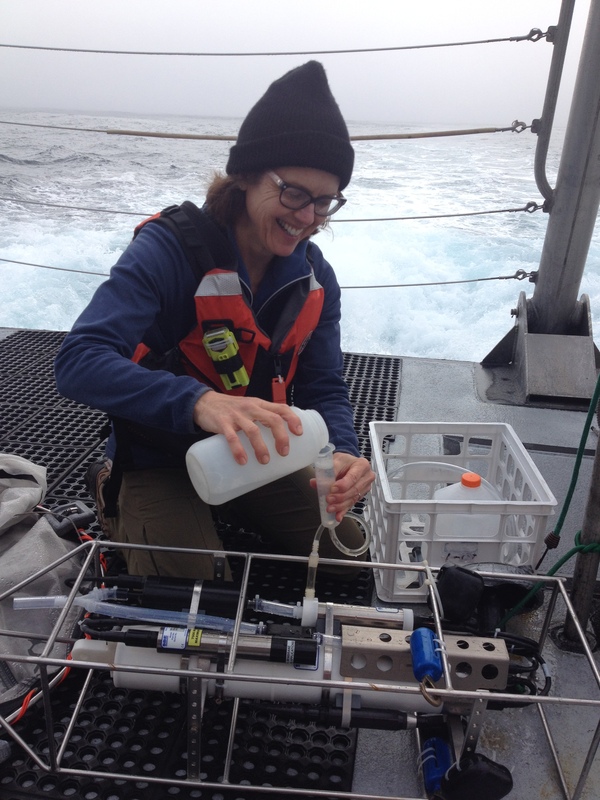 We have had some pretty bumpy experiences transiting to sampling sites and so far so good.I have learned to always keep one hand on the boat when walking around, and not to go below deck when the ship is moving. It surprises me to experience what a workout my legs are getting simply by working to maintain my balance. Even while sitting here writing on my computer I have to constantly engage my legs so I don’t fall over. The Traffic Separation Scheme (TSS) separates ship traffic going in opposite directions, much like a median strip separates opposing lanes of cars on a freeway. 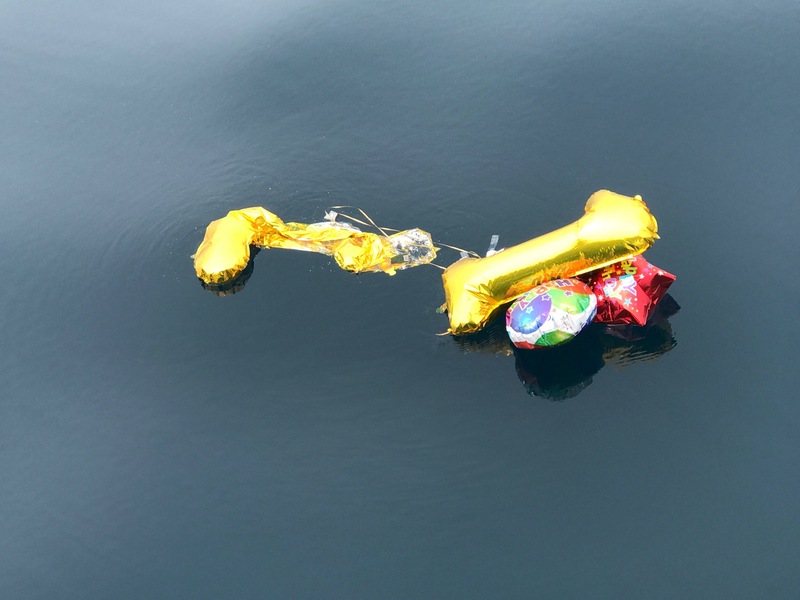 The TSS is marked on nautical charts so that traffic proceeds safely.